Insomnia: How To Get A Great Night Of Sleep! 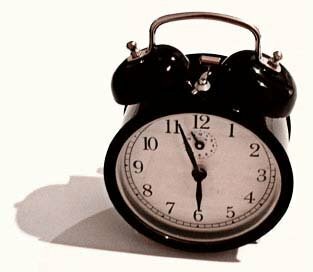 Time flies at night when you're trying to recover for the next day when all of a sudden your alarm clock goes off. It's frustrating. Here are some suggestions that may help you feel great in the morning. Time flies when your having fun. Time flies at night when you're trying to recover from a workout and refuel yourself for the next day when all of a sudden your alarm clock is going off. Yeah, it's frustrating. As frustrating and aggravating as it is that's not the worst part. Not getting a good night sleep will leave you feeling tired, not being able to function. Peter Hauri, Ph.D., director of insomnia program at Mayo Clinic in Minnesota says that about 17% of people have trouble sleeping. If you are one of these people, this article will provide you with some information that may help you feel great in the morning. Insomnia has many causes. Psychological stress, which cannot be cured with medication, is a common problem. So before you try to pop pills, try some of these methods. If you sleep an hour or two, or three everyday after work, school, or a morning workout you may have trouble falling asleep at night. Skip the nap and save it for later, remember a full night sleep is better than broken sleep through the day. 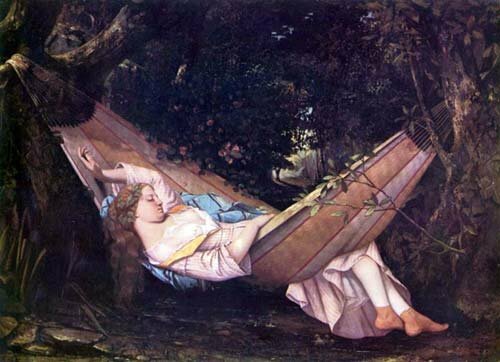 Die Hängematte, "The Hammock" By Gustave Courbet, 1844. This is a problem I have myself. I will be checking the clock every few minutes, calculating how much sleep I will get. All this will do is distract you from getting the sleep itself. You should be relaxing, not getting up to look at the clock. Set it for a time you want to awake, hide it in a draw or a closet. Don't Be Distracted By The Clock. Drinking caffeinated beverages at night is a guarantee that you'll burn the midnight oil. Sometimes your body will just not be able to fall asleep. Instead of getting angry, and keeping yourself awake for a longer period of time, try reading a book, magazine, or drinking some milk. When you start to feel sleepy, try getting in bed again. Your bed should only be used for sleeping, and you know... Don't treat your bed like a second office, if you work on your bed, pay bills, read the mail, it will treat you like an employee. Time is money, and your boss, the bed, doesn't want you wasting time sleeping on the job. The classic method of falling asleep, a warm glass of milk. An amino acid called tryptophan found in milk is what helps you go to sleep. Tryptophan was used to treat depression and premenstrual problems. It was also used to treat drug and alcohol cravings and to minimize appetite. In 1989, some users started to develop a painful muscle problem called eosinophilia-myalgia syndrome. The FDA removed tryptophan from the market. Eosinophilia-myalgia syndrome (EMS) is an incurable and sometimes fatal flu-like neurological condition that is believed to have been caused by ingestion of L-tryptophan supplements. Similar to regular eosinophilia, it causes an increase in eosinophil granulocytes in the patient's blood. Recent research from FDA has shown that the association of EMS with the a specific brand of tryptophan supplement may be false (Smith & Garrett, 2005). Many brands of tryptophan supplements are now known to be associated with this medical condition, which may be caused by tryptophan interference with toxic histamine metabolism. It is suggested that histamine then accumulates and causes the EMS syndrome. Tryptophan can no longer be bought in its purest form, but it can still be found in meat, fish and a good ol' glass of warm milk. So if you need something to make you feel sleepy, pour a glass of milk. Many of those 24 hour and 12 hour allergy medications sometimes have a drowsiness side effect. If you take drugs such as diphenhydramine or hydroxyzine you can help by relieve allergy symptoms and make you sleepy. So start to take your 12-hour or 24 hour capsules at night, rather than morning, or morning and noon. Modern herbalists recommend a balm tea made from fresh or dried leaves to calm nerves and aid in sleep. Use about 2 teaspoons of chopped leaves to one cup of boiling water. Let steep for 10-20 minutes and drink while hot. Balm supplements can be an alternative. You can find gotu kola at many health food stores. 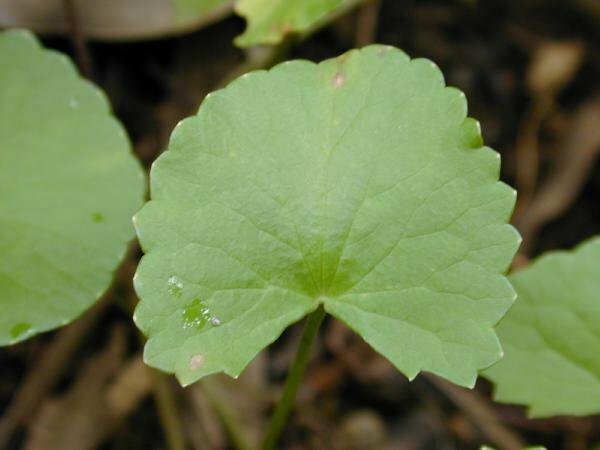 Gotu kola has been shown to help relieve anxiety and promote sleep. Photo Courtesy Of Forest & Kim Starr (USGS). Only take if all other methods fail to work. Potentially addicting, may cause drowsiness, never take with alcohol. Side effects may include headache, lethargy, vomiting, nausea, unsteadiness, loss of balance, and nervousness. Potentially addicting, may cause drowsiness, never take with alcohol. Side effects may include dizziness, slurred speech, unsteadiness and loss of balance. Potentially addicting, may cause drowsiness, never take with alcohol. Side effects may include lethargy, unsteadiness and loss of balance. May cause drowsiness, never take with alcohol. Sometimes available over the counter, depending on strength. Side effects may include dryness of mouth, nose or throat. ZMA has been showed that it helps maximize restful sleep. It's also great because it helps support hormone production and promotes lean mass, all in a natural, non-hormonal formula. This makes ZMA a must have on the supplement list for any bodybuilder or athlete.